A classic opening par-4 Hole. The ideal drive is centre left of the wide fairway, leaving a short iron to the generous green that is protected by bunkers left and right. A medium length Hole, slightly uphill to a double-tiered green. That is protected by two frontal bunkers. A short "Risk and Reward" par-4. Well positioned bunkers will threaten any drive that is not exactly in the centre of the fairway. A chance at a good birdie will be the reward for accurate play! The drive from the tee is not as tight as it appears. The lake to the right is easily carried and the fairway widens once the lake is passed. The short second to a green facing the player offers a birdie chance with a good pitch. A testing par-5 with an uphill tee drive. The olive and carob trees create a demand on accuracy. The second shot with its superb mountain backdrop requires a high carrying fairway wood to find the flat landing area. The pitch to the figure of 8 shaped green is a test of length judgment as their are bunkers left and right. 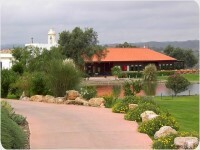 A long tee drive down a fairway lined with carob, olive and cork trees with its attractive background of the blue ocean. The downhill mid-iron approach is to a small and elevated green, requiring a powerful and accurate shot combination. A mid-length Hole, again driving uphill. The drive tends to bounce left following the fairway's gentle contours. Large old olive and carob trees can interfere with an off-line drive. A fairway bunker in the landing area threatens the slightly uphill second shot. Two bunkers and several trees defend the receptive long green. A very long uphill par-3 calling for the use of a long iron or fairway wood. A large cork tree plus a bunker to the right and to the left protect the entrance to the double-tiered green. A short par-4 Hole from an elevated tee. The waste area beginning on the right at 160 metres and continuing to 260 metres threatens faded drives. Several strategically placed small olive trees can catch wayward drives on both sides of the fairway. The second shot to a green backed by an out of bounds stream is a test of control of length through the air. Bunkers left and right are in play on all but central flag positions. The back nine opens with a downhill challenge requiring a mid-iron shot over a lake and a pot-bunker placed in the centre front of a circular green. Left is certainly a bad place to go as the bank to the right offers a 'bail-out' situation. A short par-4 driving through a narrow gap to a generous fairway. A propeller shaped bunker in front of the green, will catch the long drive. The deep bunkers left and right of the green will also punish an inaccurate pitch. However, accurate play can easily be rewarded with a birdie. A superb downhill drive with a flavour of a typical Algarvian landscape. A testing carry to a well bunkered green using a mid or long iron. A classic 'Risk and Reward' drive. The stream crossing the fairway that is in full view of the player demands a carry of 200 metres. A 'lay-up' leaves a short or mid-iron shot to a bowl-shaped green that is guarded front centre by a pot-bunker. A long drive will allow the chance to lob a high pitch near the flag and setting up another opportunity to score a birdie. A testing uphill dog-leg right Hole with a demanding finish. The tee shot is tight with a fairway trap on the left and bank on the right creating a premium on accuracy. A very long hitter may be tempted to carry the trees and rough on the right corner of the dog-leg. The uphill second shot is a test of length judgment. The green that is shaped like an up-turned saucer is a large but elusive target. A generously wide fairway encourages a big drive. However, fairway bunkers at 215 metres on the right and 235 metres on the left will catch all but the perfect drive. A lay-up is a safe and easy option. The second shot to a wide but sloping fairway should be kept left. The green is long and features bunkers and mounding left and right. Although reachable in two strokes, most will be happy to try to pitch the third shot close to the pin. The longest par-4 on the course is made more testing by an uphill tee shot. The long second shot to a circular green with a narrow opening. Bunkered left and right the shot places a demand on length and accuracy. A great short Hole, with a tee shot across a lake, to a green slightly lower than the level of the tee. The green that faces the player is inviting but a difficult target to hit with a long iron or fairway wood. The longest hole on the course beginning with an uphill tee shot and a testing par-5. The second shot offers many choices. The safest shot is down the left, avoiding the many mature trees that eat into the fairway. The third shot according to the wind and power of the first two shots will be anything from a wood shot to a wedge. 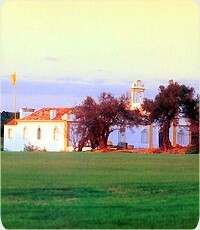 It is downhill to a large green backed by a view of the church and protected by bunkers right, left and rear. A short walk will find the player back at the comfortable Clubhouse, where the rewards of success and compensations for failure will be waiting!